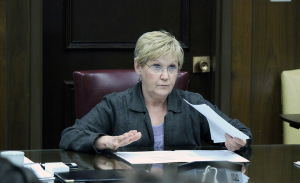 A committee of five faculty and staff advisors and six students met March 27 in the J.S. Bridwell Boardroom for the annual Student Fee Allocation Hearings. After presentations for 26 different organizations and events, committee members allocated $2,203,966, the estimated revenue for the 2016 fiscal year, among the groups. The total amount of money requested was $222,488 more than the estimated revenue for the 2016 fiscal year, but the final total amount of allocations recommended by the committee was just $2,183,000, leaving an estimated surplus of $20,966. 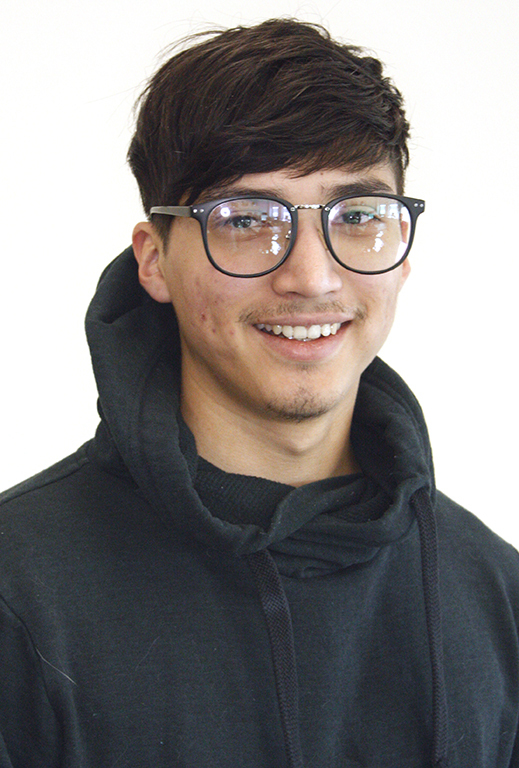 According to Phillip Mundine, mass communication senior and allocations chair, the recommended budget will got to University President Jesse Rogers for approval. If Rogers does not approve, it will go back to the committee for revision. Mundine said this process should be complete within two weeks. 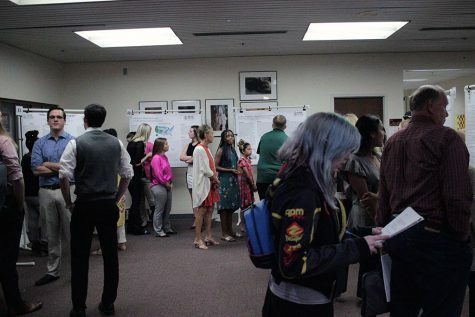 Of the 26 organizations or events represented at the hearings, only two received an increase in allocations, the University Programming Board and the Steel Pan Ensemble. The committee recommended $72,000 for the University Programming Board, an increase of $2,000 from the 2015 fiscal year. According to Cammie Dean, director of student development and orientation, UPB works to offer students many opportunities to for involvement. In the case of the Steel Pan Ensemble, the committee recommended $2,500 for next year, an increase of $1,693. According to Alan Black, assistant professor of music, the Steel Pan Ensemble needed the money to tune the instruments and replace a steel pan that Black will take with him when he retires. Fourteen groups received no change in their budgets while 10 had their budgets cut. 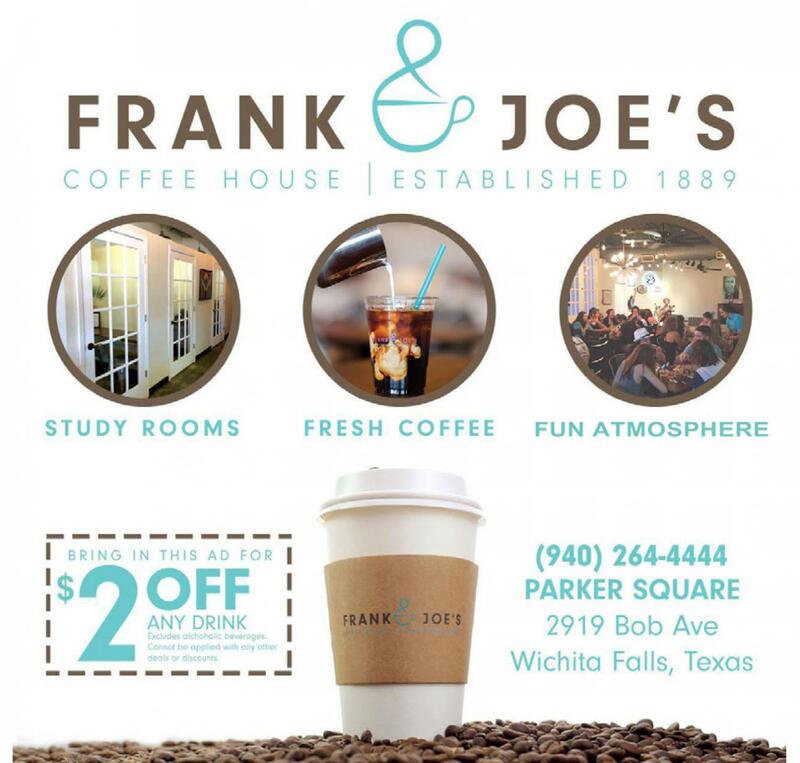 The Artist-Lecture Series, office of Career Management and Testing Services, cheerleading, Clark Student Center, recreational sports, the social media department, the student fee reserve, student government, Vinson Health Center, and The Wichitan all received recommendations for lower budgets for the 2016 fiscal year. 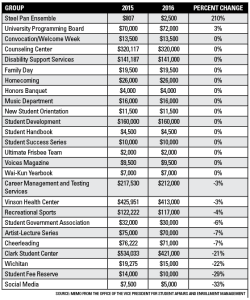 The Clark Student Center received the biggest cut, a decrease of $113,033 from its current budget. Dail Neely, director of the Clark Student Center and the office of student conduct, said the CSC was requesting a lower budget but planning to offer more services. The request comes in response to the retirement of the CSC’s renovation debt retirement next year. If the budget allows, Neely said the Clark Student Center could stay open until 2 a.m. as soon as Sept. 1 when the new fiscal year begins. 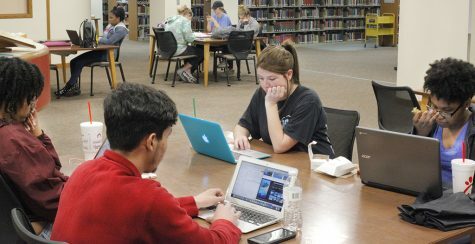 The committee recommended that the Clark Student Center still extend its hours despite cutting the budget further than what Neely requested. Since he became director of the CSC in 1997, Neely said all the student fees collected for the CSC have gone to paying off the debt of renovating the CSC. “We’re down to half a payment next year and then the following year the debt will be retired,” Neely said. According to Neely, the new budget would allow for further renovations and improvements to the CSC, including a digital system to indicate when rooms in the CSC are available. Vinson Health Center also saw a significant budget reduction, $12,951, with the stipulation that the 2014-2015 balance will roll over to next year instead of being allocated to the Student Fee Reserve. Keith Williamson, medical director of the Vinson Health Center, said the budget request was for maintaining the facility and expanding services. The Office of Career Management and Testing Services received a decrease of $5,530. The students also voted for their balance to roll over to next year. According to its director, Dirk Welch, the Career Management Center provides professional resources for students, namely resume and cover letter critiques. Welch said other services offered by the Career Management Center include the MustangsHIRE system, the electronic Mustangs Survival Guide, and interview preparation, and the new budget will be used to maintain these services. 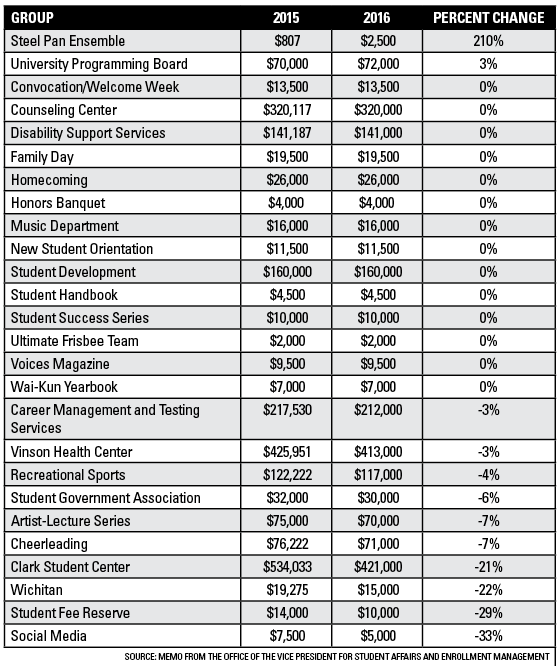 Despite receiving more requests for money than what was available, the students voted for the majority of the organizations and events receive little or no change to their budgets for next year, including All-Student Convocation and Welcome Week, the Counseling Center, Disability Support Services, Family Day, Homecoming, the Honors Banquet, the music department, New Student Orientation, Student Development, the student handbook, the Ultimate Flying Disc team (listed as Ultimate Frisbee on the official recommended budget), the Student Success Series, the Voices magazine and the Wai-Kun yearbook. 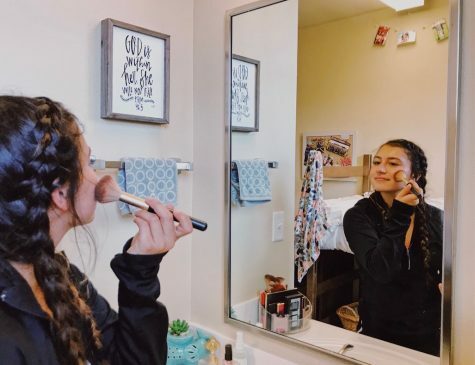 Four groups, the Honors Banquet, New Student Orientation, the Ultimate team, and the Student Success Series, requested no change in their budgets. According to Matt Park, the Honors Banquet recognizes students for academic and nonacademic reasons, and is partially funded by outside sources such as ticket sales. Angie Reay, associate director of housing and dining services, said the Ultimate team’s request for $2,000 was mostly for travel expenses and registration fees for tournaments. “The registration fees average about $350 for every tournament and they try to go to four or five tournaments a semester,” Reay said. Of the remaining 10 groups, all requested an increase in their budgets, but none received one. According to Phillip Mundine, all students on the committee are SGA members and had to be approved by the SGA office. Mundine said while the advisers offered advice, they didn’t have a vote in the final decisions. Mundine said the committee made the right decisions on who got money and who didn’t, keeping the students’ best interest in mind. “One, is it going to better serve the students is our main priority, and two, did they have legitimate reasons for why they need the money,” Mundine said. Why are cutting the fees for Vinson? We should be increasing their budget and expanding services to students such as routine physicals. Why are we decreasing the budget for Vinson? We should be increasing their budget and expanding services to students such as routine physicals.